Require sale account in product entry. If this option is selected, a sale account will be required in product entry. If this option is not selected, no sale account will be required. Require Pricing Family in product entry. If this option is selected, a pricing family will be required in product entry. If this option is not selected, no product family will be required. Allow product calendar options. When this option is selected, the product calendar options will be allowed for use. If this option is not selected, you will be unable to use the product calendar options. Show Product Description with Product Name. When this option is selected, the product description will be shown with the product name. If this option is not selected only the product name will show. Show Default Transaction Stage. If this option is selected, the default transaction stage that you selected will be shown on all products. If this option is not selected, the default transaction stage will not be shown. Show Production Time. When this option is selected, the production time will be shown. If this option is not selected, the production time will not be shown. 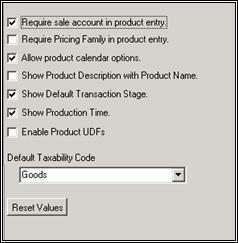 Enable Product UDFs. When this option is selected, production UDFs will be enabled. If this option is not selected, you will be unable to use production UDFs. Default Taxability Code: . This option allows you to set a taxability code to default. 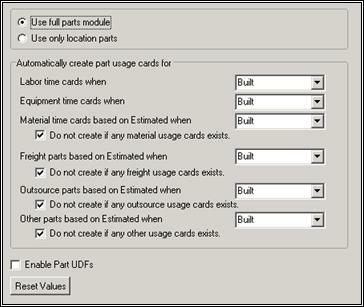 Use full parts module - If this option is selected, the full parts module will be used. Use only location parts - If this option is selected, only location parts will be used. Labor time cards when: This option allows you to choose the order status at which part usage cards will be created. Equipment time cards when: This option allows you to choose the order status at which equipment time cards will be created. Material time cards based on Estimated when: This option allows you to choose the order status at which material time cards are based on Estimated. Do not create if any material usage cards exist. If this option is selected, a material usage card will not be created when an order is changed to a Built status. Freight parts based on Estimated when: This option allows you to choose the order status at which freight parts are based on Estimated. Do not create if any freight usage cards exist. If this option is selected, a freight usage card will not be created when an order is changed to a Built status. Outsource parts based on Estimated when: This option allows you to choose the order status at which outsource parts are based on Estimated. Do not create if any outsource usage cards exist. If this option is selected, an outsource usage card will not be created when an order is changed to a Built status. Other parts based on Estimated when: This option allows you to choose the order status at which other parts are based on Estimated. Do not create if any other usage cards exist. If this option is selected, other usage cards will not be created when an order is changed to a Built status.